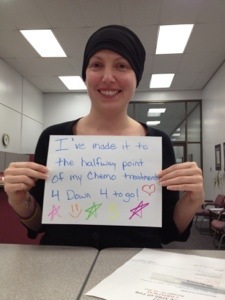 So I hit the halfway marker of chemo on Monday! What a wonderful feeling! And I will have to say the port was extremely helpful and made my treatment so easy. I think mostly I was against it because the thought of another surgery just made me so frustrated. Now part of me wishes I would have had it all along. Well at least it’s done now and hopefully I won’t have any issues from here on out. This week was a good one. My treatment was moved to Monday due to the infusion center being closed for thanksgiving and Friday. I was concerned that this would throw my schedule off at work causing more time off, but I was actually able to work and get through the whole day Tuesday-Thursday. Mind you I was beyond tired when I would get home. But I made it. Not sure what the weekend will bring as it typically takes a few days after my nuelasta shot for my body to get the side effects. Today I am staying hopeful that they won’t be as bad. I’ve got lots to do this weekend! Birthday celebrations for some of the sweetest little girls I know, work as usual on our house, outings I would like to go to. I know I have to take it easy. But today I woke up and I cried hard, all because I long for a sense of normalcy in my life. It was probably long overdue and I know having heightened senses is another side effect to my never ending meds. But some days it is just so much to deal with. I know it will get better and that I’m halfway through chemo which is huge. I guess I should be holding on to that thought for now and stay positive. Monday the 10th will be treatment number 5. It will be my first of 4 treatments if Taxol. Not really sure what to expect other then they give me a good dose of Benadryl as a pre med and the taxol takes 3 hours to administer via IV. I hope it’s not as harsh on my digestive system as the Adriamycin and Cytoxin were. That’s what they tell me anyway. Looking through this post and past ones I realized I are the word Hope repeated. I understand why it’s so widely used in the cancer and breast cancer community. Some days, hope is all you have. So I will couple that with faith today and pray that the days ahead are a little easier then the ones I’ve put behind me.